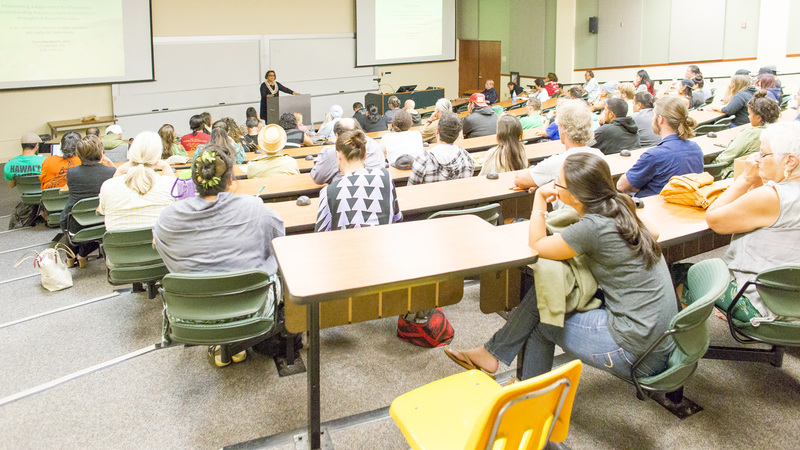 Mountains, along with their cultural roots in practice and inspiration, extends the central idea of “E Nihi Kahele: Maintaining a Kapu Aloha for Mauna Kea,” held at UH Hilo on April 9, 2015. Manu Aluli Meyer addresses the audience at the recent gathering, “E Nihi Kahele: Maintaining a Kapu Aloha for Mauna Kea.” Photos by Jaysen Niedermeyer. Click photos to enlarge. 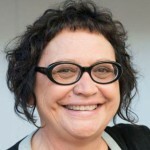 Manu Aluli Meyer. Courtesy photo. Clashing cosmologies help us know wholeness. This is how I see the event before us. As a kanaka ʻōiwi with kupuna connection to Waiolama, Kukuau, Hilo One, and Kohala on Moku O Keawe, there is love, awe, and function to Maunakea. For this reason, mountains, along with their cultural roots in practice and inspiration extends the central idea of this summary of “E Nihi Kahele: Maintaining a Kapu Aloha for Mauna Kea,” held at UH Hilo on April 9, 2015. 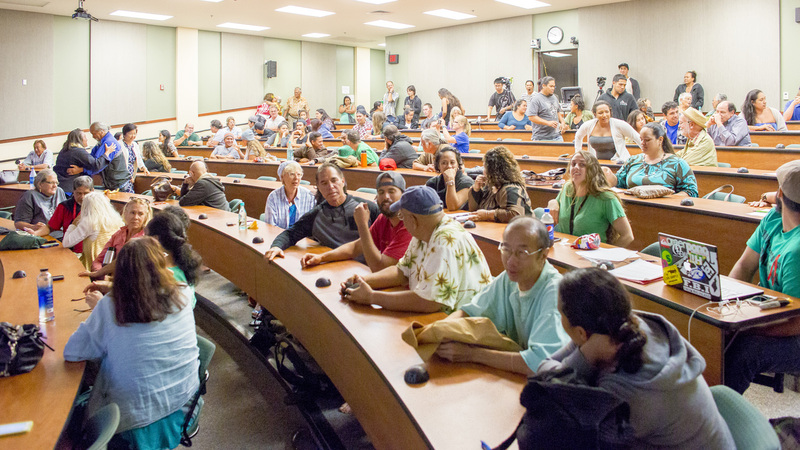 This two-hour community meeting attended by 80-plus people introduced the central operating principle of our Hawaiian movement: Ku Kiaʻi Mauna — to stand firm in our protection of Maunakea. This aloha ʻāina stance to remain steady is protected and instructed by a Kapu Aloha. 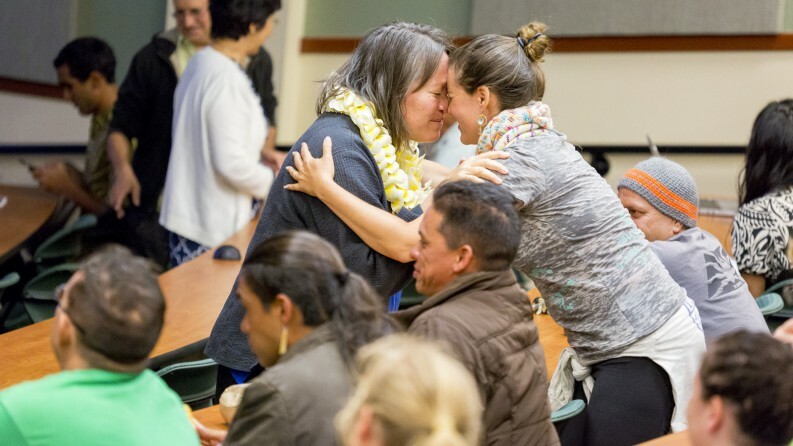 This event brought together three wahine to discuss their insights on this process. Participants engage in breakout discussions. Click to enlarge. A Kapu Aloha is a multidimensional concept and practice inspired by our kupuna. 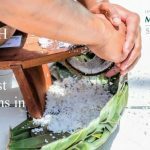 It has been used within a Hawaiian cultural context for many years, but this may be the first time it has been brought out into a public sphere. It places a discipline of compassion on all to express aloha for those involved, especially those who are perceived to be polar to our cause. A Kapu Aloha helps us intentionalize our thoughts, words and deeds without harm to others. It honors the energy and life found in aloha — compassion — and helps us focus on its ultimate purpose and meaning. It is a synonym for ahimsa, non-violence, and peaceful consciousness. 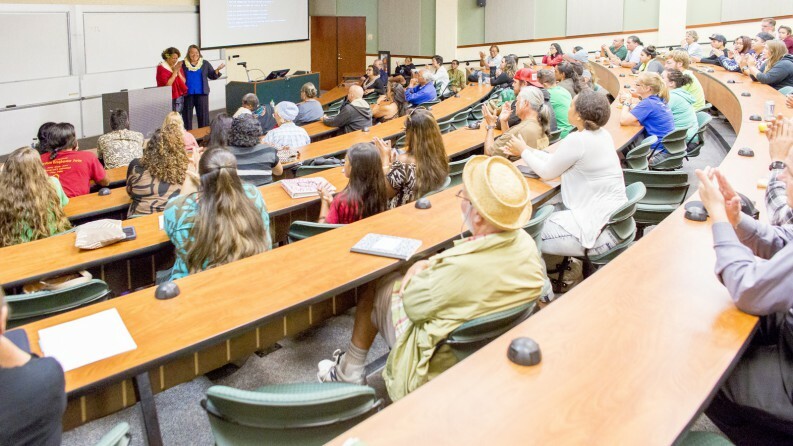 This hui wānana was called to explore cultural insights and histories to bring forward the continued clarity of why Hawaiians and environmental allies occupy Maunakea. Ngahiraka Mason from the Tuhoe tribe of Aotearoa gave an intimate summary of her own experience and understanding of relationships to mountains. These relationships are affirmed through pepeha — cultural sayings — that inspire, guide, and instruct. Māori look to these pepeha in times of conflict to remember the visionary words and deeds of elders. They help us make decisions about difficulties we face, even when families are pitted against each other. Ko au ko koe, ko koe ko au — I am you and you are me — summarized what I learned from her support. Ngahiraka Mason from the Tuhoe tribe of Aotearoa gave an intimate summary of her own experience and understanding of relationships to mountains. 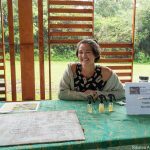 Luana Busby-Neff then spent an hour weaving intimate stories of her native Molokaʻi, the genesis of PKO – Protect Kahoʻolawe ʻOhana — and she gave us tales of the love Hawaiians have for science, kupuna, ʻāina, pono, intelligence and collective excellence. 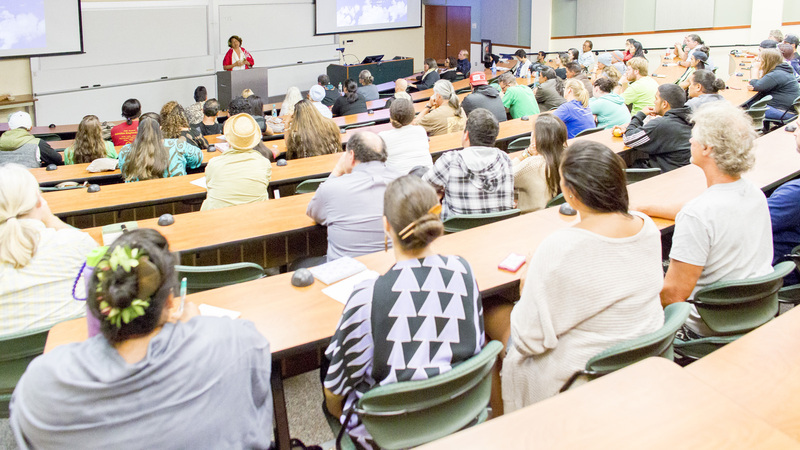 It was a mythic sharing that spanned the scope of the Aloha ʻĀina movement. 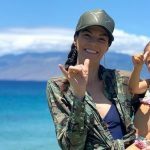 She then outlined how her 30-plus years in protest shifted in one 24-hour vigil in Kona where she instead “affirmed” why she was committed to Aloha ʻĀina. In that one event she came to understand that movements, if they are to survive and to be effective, must affirm something instead of protest what should not be done. Here is the key to energy and to the activation of pono. She then gave us a clear understanding of a Kapu Aloha and why it was called for Maunakea. 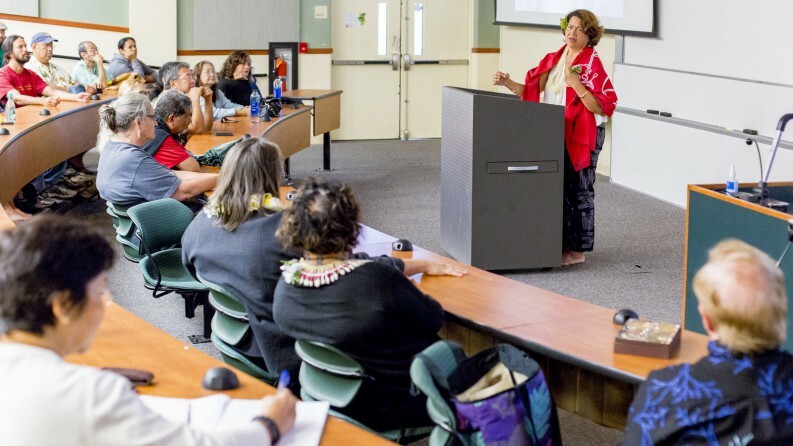 Luana Busby-Neff spent an hour weaving intimate stories of her native Molokaʻi, the genesis of the Protect Kahoʻolawe ʻOhana — and she shared tales of the love Hawaiians have for science, kupuna, ‘āina, pono, intelligence and collective excellence. Luana’s stories nourished us and Ngahiraka’s ideas linked us to an awakening among native peoples. 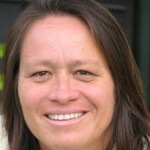 Manu Aluli Meyer saw her role at the gathering to link the teachings of the other two speakers into a mana moana collective — a rising movement within Pasifika — so that patterns could be seen and the movement could be placed within a larger system steadied by the needs of the time and the clarity of indigenous peoples. 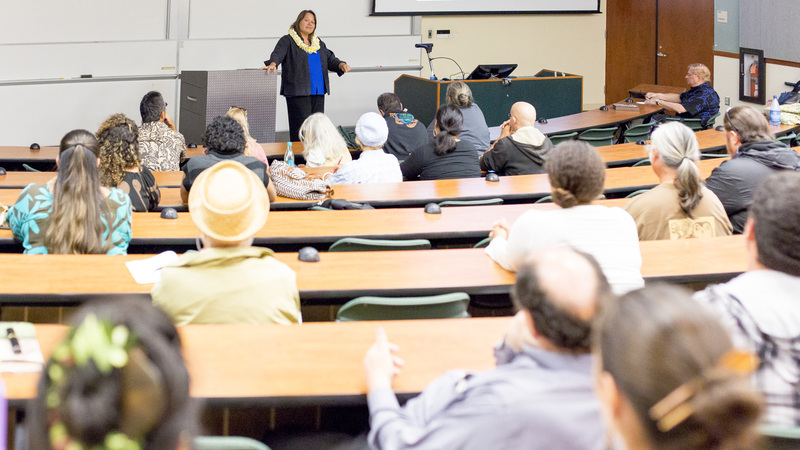 It was my job to link both into a mana moana collective — a rising movement within Pasifika — so that patterns could be seen and this movement could be placed within a larger system steadied by the needs of our time, and the clarity of indigenous peoples. As I have been pulled often into the messiness of perceived polemics of this debate, coming to detail the inside energy of this new chapter of Ku Kiaʻi Mauna was a serious commitment to the efficacy and function of a Kapu Aloha. Mahalo to Chancellor Don Straney and Gail Makuakāne-Lundin (interim vice chancellor for student affairs) for their support of this event. I know this issue is difficult for many, but for us now because a Kapu Aloha has been called, the seeing is clear and restful. 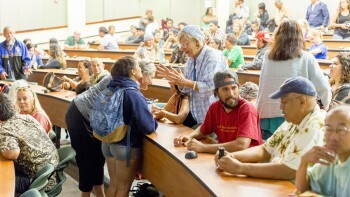 We are committed to a peaceful, compassionate and pono occupation of Maunakea that may take years. I do not think it will take that long. Because of the truth now being broadcast across social media, millions are now aware of this issue and we are being asked to remain true to what Kapu Aloha means and how it amplifies infinite capacity and potential. Such is the power of love! We are grateful to Nā Ao Koa, or as beloved kupuna Hale Makua envisioned, our Warriors of Light on the mountain who bring truth and Hawaiian intelligence to a world waiting for this kind of clarity. 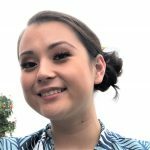 Ku Kiaʻi Mauna! 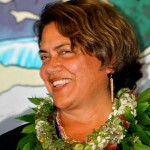 Manulani Aluli Meyer, former UH Hilo associate professor of education, is a world scholar-practitioner of Hawaiian and indigenous epistemology. She is currently Kanilehua Scholar in Residence at UH Hilo, teaching a course on Hawaiian health and well-being and another on cultural competencies. She received her doctor of education from Harvard in 1998. 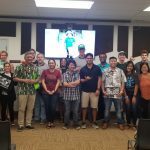 Photos by Jaysen Niedermeyer, a senior at UH Hilo majoring in marine science and an intern in the Office of the Chancellor. People engage in a break out session, to discuss the issue with the person sitting next to them. Click photos to enlarge. 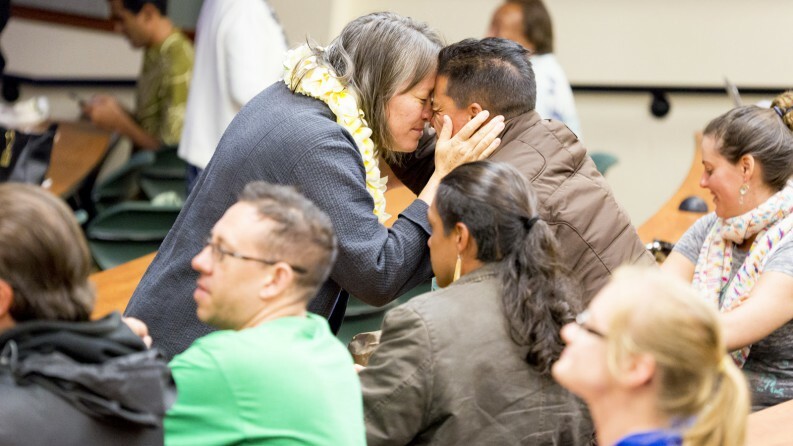 Manu Aluli Meyer greets a friend in the audience with honihoni. 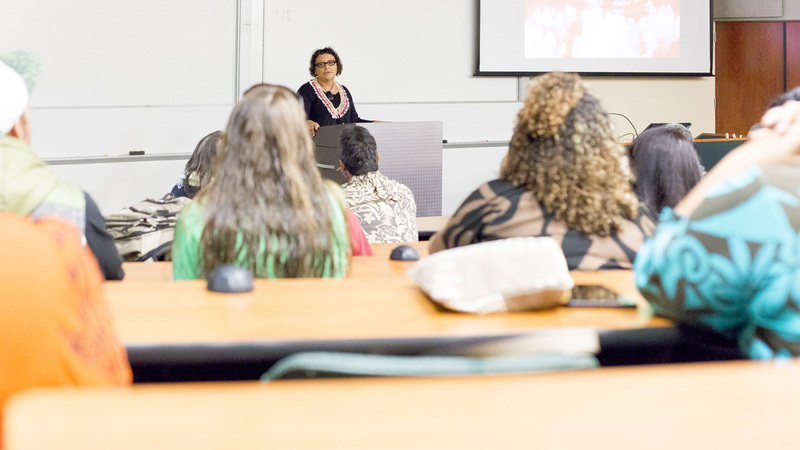 Luana Busby-Neff shared stories about her native Molokaʻi and the genesis of the Protect Kahoʻolawe ʻOhana. Manu Aluli Meyer and the audience thank Luana Busby-Neff for her presentation. Ngahiraka Mason from the Tuhoe tribe of Aotearoa gave an intimate summary of her own experience with mountains. Manu Aluli Meyer greets friend with honihoni. Students discuss issue in break out session.